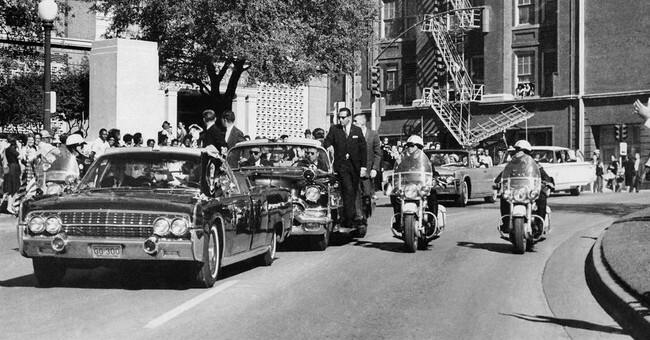 Tomorrow is the 50th anniversary of the assassination of President John F. Kennedy in Dallas. Anyone over the age of 55 will be asking everyone else over the age of 55: "Where were you when you heard the news?" We all know exactly where we were. I was a senior at West Orange Mountain High School in West Orange, New Jersey. I was in drama class in the auditorium and the teacher, Miss Levin, asked me to go backstage to get some piece of business that she needed to demonstrate a point. While back there, I spotted a radio and I turned it on. I don't remember what station I tuned it to, but it was probably WABC-AM radio because they played a lot of Beatle's tunes. The first reports from Dallas were just coming in. Those reports indicated that both President Kennedy and Vice President Lyndon Johnson had been shot. They were in error. The second person shot was Texas Governor John Connelly - about whom, more later. I had just read - remember I was 16 at the time - I had just read the thriller "Seven Days in May" which has to do with the Chairman of the Joint Chiefs of Staff plotting a coup against the President. I said aloud "Oh, my God. It's coming true," even though I was alone. I ran out to the stage and told Miss Levin what I had heard. She instructed me to go to the Central Office and tell them. I was such a pest in high school that I had a reserved seat on the naughty bench in the central office where I would sit until the Assistant Principal could get to me, patiently explain to me how I was ruining my life, bringing shame and dishonor to my family, and then mete out an appropriate punishment for whatever horror I had committed. I stopped off at the classroom of my Social Studies teacher, Mr. Vince Mirandi (who was also the school soccer coach) to tell him what had happened. Someone in the back of the class, knowing about my reserved spot in the central office shouted, "Let's wait until we hear something official over the loudspeaker." I can't remember who that was, but it would not surprise me to find out he is a high ranking official at the NSA today. As soon as the officials could get the buses organized, school was dismissed. I got a ride home from someone and as I remember it my mom had gone out to collect my younger brother and sister from their schools. My older brother was at Cornell University in Ithaca, New York and out of her range. The Rabbi was at the front of the Temple speaking to people and, at some point he began (I think this right) an impromptu Yiskor service which is the memorial service for those Jews in the community who have lost a loved one. My mom - who was not particularly political - had told us en route to the Synagogue: "We're going to pray for our President." Years later, when I was the communications director for the National Republican Congressional Committee we had a fund raiser on the ranch of former Governor (as a Democrat) and former Treasury Secretary (as a Republican under Richard Nixon) John Connelly. It came to pass that the Chairman of the NRCC, Rep. Guy Vander Jagt (R-Mi) needed to get to the airport and I was elected to drive him. Governor Connelly said he would come along and, as the higher ranking person, sat in the passenger seat next to me. I drove the quarter mile from the ranch house to the Farm to Market Road leading to the airport and hit the gas. Governor Connelly was talking with Rep. Vander Jagt, stopped in mid-sentence and said to me, "Speed on up, son. If you want me to drive pull over." I said that I was doing about 70. He said, "You can drive as fast as this thing will go. You ain't gonna get no speeding ticket while ah'm in this car." Years after that, I was appointed by the Mayor of Dallas, Steve Bartlett, to bid for the Special Olympics to be held in that city. Bartlett, as a conservative, Republican, Member of Congress from Dallas was a big supporter of the Americans with Disabilities Act. The Special Olympics Committee was impressed with our commitment to making the Games a success and to being able to raise the funds necessary to accomplish that goal. The Special Olympics were conceived by, and under the control of, the Kennedy family. Things were going apace until Senator Ted Kennedy found out about it. He instructed the Special Olympics committee to cease, immediately, negotiating with Dallas and the Games went elsewhere. I was at the Dallas-Fort Worth Airport when the Executive Director of the Special Olympics called to tell me he had to pull the plug.